Many of the 1970 - 1981 came with a GM option "deluxe exterior molding package". Vertical oor edge guard moldings. Even if your Camaro wasn't originally equipped with the optional exterior molding package, you can still install it to your Camaro some light modifications will be needed on the door top moldings (Call us and we can explan the process) Also not you will need to replace the door top window sweeps in doing this conversion on a non optioned car to the window sweep weather seals with NO chrome bead as the chrome door top moldings replace the smaller stainless trim on the weather seals. 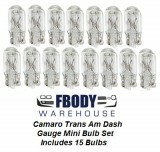 Shipping to USA only on this item. 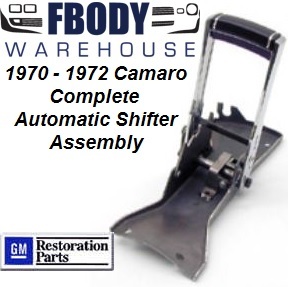 1970 - 1972 Camaro Center Console Automatic Horseshoe Shifter 100% Complete!